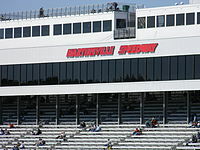 "The Augusta National of Race Tracks"
Martinsville Speedway is an International Speedway Corporation-owned NASCAR stock car racing track located in Henry County, Ridgeway, Virginia, just to the south of Martinsville. At 0.526 miles (847 m) in length, it is the shortest track in the Monster Energy NASCAR Cup Series. The track was also one of the first paved oval tracks in NASCAR, being built in 1947 by partners H. Clay Earles, Henry Lawrence and Sam Rice per Virginia House Joint Resolution No. 76 on the death of H. Clay Earles. (Whereas Clay Earles and his partners, Sam Rice and Henry Lawrence, opened the Martinsville Speedway in 1947 on a 30-acre site, one of the first of its kind in the nation ...) It is also the only race track that has been on the NASCAR circuit from its beginning in 1948. Along with this, Martinsville is the only NASCAR oval track on the entire NASCAR track circuit to have asphalt surfaces on the straightaways, then concrete to cover the turns. The track is often referred to as paper clip-shaped and is banked only 12° in the turns. The combination of long straightaways and flat, narrow turns makes hard braking going into turns and smooth acceleration exiting turns a must. The track was paved in 1955 and in 1956 it hosted its first 500-lap event. By the 1970s, a combination of high-traction slick tires and high speed was putting excessive wear on the asphalt surface. In 1976 the turns were repaved with concrete (a rare concept in the 1970s). By 2004, the then 28-year-old concrete had shown significant wear. On April 18, 2004 a large chunk of concrete had become dislodged from the track's surface and caused severe damage to the body of Jeff Gordon's car. In reaction to this, the track was fully repaved with new concrete and asphalt. Until 1999, Martinsville was notorious for having two pit roads. The backstretch pit road was generally avoided because if a team had to pit there during a caution, any car pitting on the front stretch had the advantage of pitting first and not having to adhere to pace car speed upon exiting their pit road. This was rectified when pit road was reconfigured to extend from the entrance of turn 3 to the exit of turn 2. This move allowed for a garage to be built inside the track, and leaves Bristol as the only active NASCAR track with two pit roads. The first NASCAR sanctioned event was held on July 4, 1948. In 1951, only four cars were running at the finish, the fewest of any race held at the speedway. In 1960, Richard Petty became the youngest winner at Martinsville, at 22 years, 283 days; to date[when?] Petty has the most wins (15). In 1991, Harry Gant became the oldest winner at 51 years, 255 days. It was Gant's fourth win in a row, earning him the nickname Mr. September. Ownership of the track was a joint venture of brothers Jim and Bill France, Jr., and H. Clay Earles, the majority owner, along with daughters Dorothy Campbell and Mary Weatherford, and Dorothy Campbell's children, Sarah Fain and Clay Campbell. In 2004, the track was sold exclusively to the France family for over $200 million as a result of an estate sale following the death of Weatherford. The tower above the finish line at the speedway. Plans had existed to add an additional 20,000 seats along the back stretch, boosting capacity to over 85,000 seats. In 2005–2006 the Norfolk Southern Railway behind the track was moved 200 feet to make way for the added seats, but nothing more has been officially mentioned regarding this by track management since the sale of the track to ISC. From 1982 until 1994, and again in 2006, the speedway hosted Busch Series events. This occurred first with 200- and 150-lap features (200 laps for the two races with Whelen Modifieds, 150 laps with the September Winston/Nextel Cup race), then 300 laps from 1992 until 1994 as part of a Late Model/Busch Series doubleheader, and 250 laps in the one-off in 2006. The venue was dropped from the Busch Series schedule for 2007 and a race at Circuit Gilles Villeneuve in Montreal was run on the open date. Currently, Martinsville hosts two Monster Energy NASCAR Cup Series races — the STP 500 in late March or early April and the First Data 500 (race seven in the Monster Energy NASCAR Cup Series Playoffs) in late October or early November — along with NASCAR Gander Outdoors Truck Series, NASCAR Whelen Modified Tour which is held on Labor Day weekend under the lights, and Late Model races. Winners of the NASCAR Cup Series, Truck Series, and Whelen Modified events receive a longcase clock as a trophy, a nod to Martinsville's famous furniture industry. This tradition started in 1964, when Earles decided he wanted to present a trophy that would reflect the Martinsville area. He chose clocks made by a local company, Ridgeway Clocks (now a subsidiary of Michigan-based Howard Miller). The clocks presented as trophies are currently (2009) valued at around $10,000. The two Monster Energy NASCAR Cup Series races at Martinsville seem to be on solid footing, despite the somewhat frequent rumblings of the track losing one of its race dates. As recently as December 2008, Track President Clay Campbell said that no one, either from NASCAR, or track owner ISC, has hinted at taking a race from Martinsville and he plans on the sport being there in the long-term future. After multiple Late Model races were forced to count caution laps in later segments in order to beat sunset, and the 2015 fall Cup race ended at sunset, the track announced on October 12, 2016, in a news conference with Campbell and Dale Earnhardt Jr., that the track would be adding a 5-million-dollar LED lighting package. Campbell also explained that Martinsville Speedway would be the first sports arena with an all-LED lighting package. Campbell said that the track did not then have plans in place for nighttime races, with its premier series dates in 2017 already locked in to start at 2 p.m. ET (in April) and 1 p.m. ET (October). But Campbell indicated that the $5 million initiative should provide flexibility in case of inclement weather. The project was completed in early February 2017 with testing of the lights in certain sections, then fully lighting the track in mid-February. It was also announced that the 300-lap NASCAR Late Model race will be the first NASCAR race to run in prime-time with the new lighting system in early October 2017. Following a directive by some tracks NASCAR announced in late February to early March 2017, Martinsville was one of three races during the second half of the season (and the only one in the playoff) to experiment with a compressed two-day schedule featuring Saturday practice and Sunday afternoon qualifying, with the race starting between 90 minutes to two hours after the conclusion of knockout qualifying. The playoff race will now finish under the lights, as qualifying will move to 12:10 p.m., and after the session (which typically lasts an hour), the race will start around 3:00 p.m. (typically this would mean the race starts between 15 and 25 minutes after the hour), where with sunset being around 6:25 p.m., meaning the final laps will be run at night. The experiment was not repeated in 2018, but the start time for the 2018 race was set for 2:30 PM, meaning the conclusion of the race will be at dusk around 6 PM. On January 28, 2019, it was revealed on ISC's 2018 annual report that the speedway's track seating was reduced from 55,000 to 44,000. On April 3, 2019 NASCAR announced significant changes to the Martinsville schedule including a return to the track for the NASCAR Xfinity Series in late October 2020, the STP 500 being moved to Mother's Day weekend under the lights, and the NASCAR Gander Outdoors Truck Series racing only once at the track on a Friday night in late October. ^ "News Archives - Hot Rod Network". Hot Rod Network. Retrieved May 13, 2017. ^ "sportsillustrated.cnn.com". Retrieved 15 July 2018. ^ "Timeline - Martinsville Speedway". www.MartinsvilleSpeedway.com. Archived from the original on April 27, 2009. Retrieved May 13, 2017. ^ McGee, Ryan (March 24, 2009). "The Timeless Victory". ESPN.com. ESPN Internet Ventures. Retrieved March 25, 2009. ^ Albert, Zack. "Martinsville Speedway announces addition of LED lights". NASCAR.com. Martinsville, Virginia: NASCAR Media Group, LLC. Retrieved October 13, 2016. ^ "Watkins Glen, Martinsville moving to Cup qualifying and race on same day". foxsports.com. Wikimedia Commons has media related to Martinsville Speedway.